I love your card! The colors are really cool! I think I might want to case you so I can sew some too! Cute card. i have this set coming in a few days. I'm not sure what I'm going to do with it but i think it is adorable. You did a good job with it. Cute card! Love the sewing and layers you made. Great card! I love the sewing on your card! Makes me want to get my sewing machine out more often! 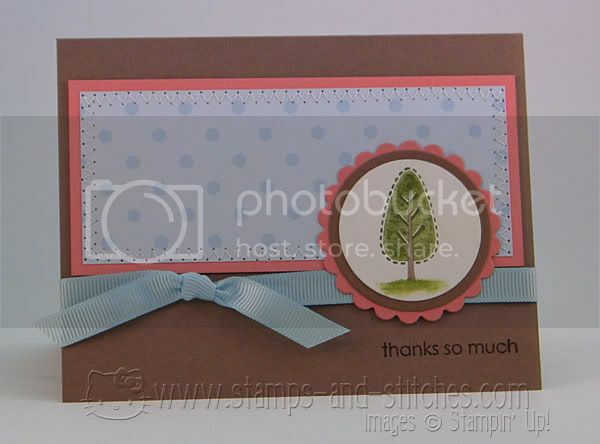 What a sweet card - love those colors together!!! AND your sewing is AMAZING!!! WOW!!! Hi Gale, you did a great job : your card is so pretty !! And I loooooove the new look of your blog ! Love Cupcakes and Hello Kitty ! Have a great day ! This is just the sweetest little card! I love what you did with it! I think you did a great job! I can start with a sketch and in the end, you can't even tell that's where I started! This tree set is cute, I almost bought it, but was afraid I wouldn't find enough use for it. It looks great like this! Your card is so cute! I love the stitching. this is so pretty! I love this set!Your colors and your layout are soooo pretty! Great Job Gale! i really want a sewing machine. Great tree card!! You did an amazing job with it.